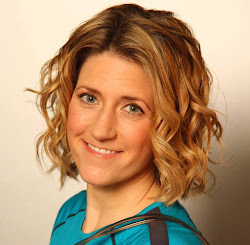 I first heard about Graze.com from Nic's Nutritionhttp://nicsnutrition.com/. 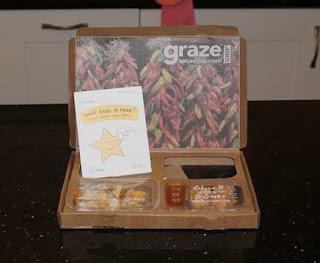 Nicola is a registered dietitian and said very good things about Graze's snack boxes. I grabbed her code and tried this service out for myself. After creating a profile on the website, there is a huge menu of snacks to choose from. I went with the 'lightbox' option which are low calorie snacks. Graze describes is as "All our lowest calorie nibbles. Everything's between 54 and 146 calories and nothing tastes like diet food. Great if you're watching your weight." The two other options are Eat Well and Boost. After choosing a plan, you have several pages of snacks to 'like,' 'bin,' or 'try.' I decided to 'try' everything except the few that sounded very spicy (what can I say? I am a wimp). With my lighter option, many of the chocolaty choices were unavailable. This is good though as I am primarily using my snacks for the 3pm munchies. I am trying to put healthy energy into my body, rather that my stand-by of Diet Coke and a candy bar. On Fridays (you choose the day and frequency of delivery), my snack box arrives in my work mail slot (shipping is included in the price). The pack is about the size of an Ipad. Inside are 4 treats picked out for me. 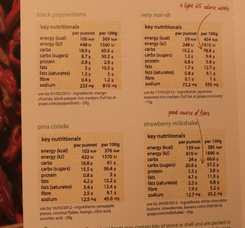 The packaging (both box and punnets) is recyclable and includes a napkin and nutritional info pamphlet. Also enclosed are coupons/vouchers for your friends to give Graze a try for free (keep reading for your chance). I am being more label conscious and love that this info is provided. The packs are a handy size to stick in your purse, lunch box, or backpack and allow you to choose health over convenience. Have a look on their site for ideas on which nuts, fruits, crackers, and other nibbles that can be combined for a delicious treat. Remember that portion control is key. Limit the snack to 30g or a 1/4 cup. Live in the UK (I emailed about the USA and they are focusing on UK for now. Bummer) and fancy giving Graze a go? Use this promo code for a FREE BOX: JLT7C18. Each time someone uses the promo code, I will donate £1 to the graze school of farming - Uganda. Students are taught how to grow avocados, lemons, mangos, oranges, paw paws and sweet bananas. It is good and to receive, isn't it? Comment here with which is your favorite punnet or if the site inspired you to make your own healthy treat.